Geographical variation: Three subspecies, all extant. Three Kings bellbird A.m. obscura (At Risk/Naturally Uncommon); Poor Knights bellbird A.m. oneho (At Risk/Naturally Uncommon); bellbird A.m. melanura (Not Threatened). 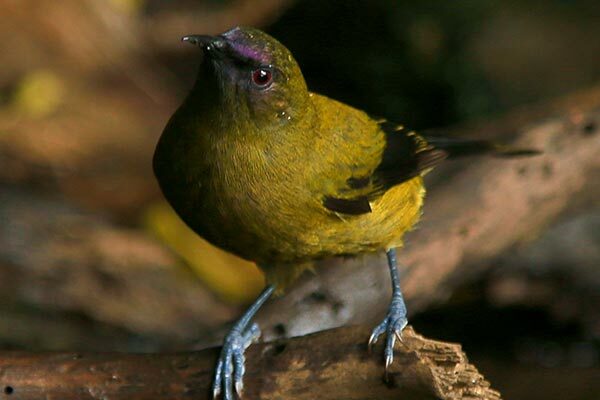 The only other member of this endemic genus was the extinct Chatham Island bellbird A. melanocephala. Bellbirds are the most widespread and familiar honeyeater in the South Island, and are also common over much of the North Island. Their song is a welcome sound in mainland forests that otherwise may have little native bird song. Although they have a brush-like tongue which is used to reach deeply into flowers to reach nectar, bellbirds also feed on fruits and insects. In feeding on nectar they play an important ecological role in pollinating the flowers of many native trees and shrubs. Subsequently, when feeding on the fruits that result from this pollination they have a role in dispersing the seeds, and so they assist in the regeneration of the forest in at least two ways. Bellbirds are green with a short, curved bill, slightly forked tail, and noisy whirring, fast and direct flight. Adult males are olive green, slightly paler on the underparts, with a head tinted purple; wings and tail blackish. Female are browner with narrow white-yellow stripe across the cheek from the base of the bill, and bluish gloss on top of head. Adults of both sexes have wine-red eyes. Juveniles are similar to females, but with yellowish cheek stripe, brown eyes and lacking the bluish gloss on the head. 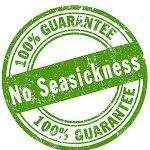 Voice: song varies regionally but is ringing notes without grunts or wheezes. Alarm call a rapidly repeated harsh “yeng,”. The famous bell notes noted by Sir Joseph Banks in Queen Charlotte Sound on James Cook first voyage to New Zealand are only heard when many birds are present at once, mostly at dawn and dusk in places of high bellbird density with few other bird species. Similar species: greenfinch is smaller with a large, pale, conical bill and no purple or blue on the head. Tui is very different in appearance but has similar song that can be distinguished (usually) by the inclusion of additional less musical notes than bellbird, e.g. grunts, clicks and wheezes. Bellbirds are found in native and exotic forest, scrub, farm shelter belts, urban parks and gardens throughout the North, South, Stewart and Auckland Islands and many offshore islands, although notably rare on the mainland from Waikato northwards, other than on Coromandel Peninsula (where they are common). Bellbirds are common throughout most of their range, and can reach extraordinarily high densities on predator-free offshore islands. For example, densities of 5.5 to 9.1 pairs per hectare have been reported from Aorangi Island, Poor Knights Islands. 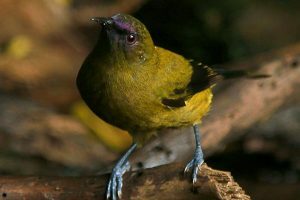 Bellbirds have survived well on the mainland and elsewhere in the presence of introduced predators, although they occur in much greater densities on predator-free islands. The cause of the rapid decline of the bellbird from Northland and around Auckland in the 1860s is a matter for speculation. At least nine attempts had been made to translocate bellbirds to islands or mainland sites up to 2012; most failed, and none has yet resulted in a well-established population. Bellbirds breed in spring and summer, building a loose nest of twigs and grasses, lined with feathers and fine grasses. Most nests are in a fork under dense cover, from near ground level to >5m. The clutch size is typically 3-4, rarely up to 5 eggs. The female incubates and both parents care for the young. Bellbirds are territorial when breeding, but may leave the territory to feed at nearby sources of concentrated food, such as nectar. After breeding they move around, usually alone, although several may feed simultaneously in a flowering tree. Males are substantially larger than females and often dominate at concentrated food sources such as nectar sources. The outer primaries of males are notched and these produce a whirring when the birds are in flight and males accentuate the sound during territorial disputes. The oldest known bird was over 8 years. Banded birds have moved up to 10 km, but they are likely to move greater distances when searching for concentrated food source during winter. Birds that naturally colonised Tawharanui (North Auckland) are believed to have flown from Little Barrier Island 23 km away. Bellbirds mainly feed on nectar from many native and introduced plants. In late summer and autumn they take fruit, and in beech forests they take honeydew from scale insects on beech trunks. Bellbirds also eat many insects and spiders by gleaning trunks, branches and leaves; also by hawking. Young appear to be fed insects almost exclusively.